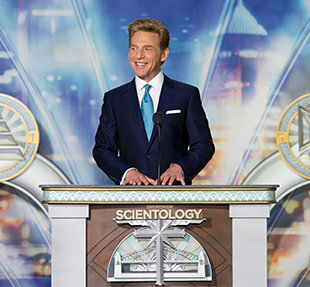 Mr. David Miscavige, Chairman of the Board Religious Technology Center, led the dedication. A Castlereagh Street filled with Scientologists from across the region greeted Mr. Miscavige. Mr. David Miscavige, Chairman of the Board Religious Technology Center and ecclesiastical leader of the Scientology religion, with (left to right) President of the Australian Human Rights Council for Education, Dr. Sev Ozdowski OAM; the Honourable Julie Owens MP; Programmes Manager, Young Offenders Support Service, Ms. Kalisi Bese; and Aboriginal Elder of the Dunghutti people, Mr. Bill Allen. The new Sydney Ideal Org stands amid several of the city’s most treasured landmarks—including Town Hall, the Queen Victoria Building and Sydney Tower. Originally constructed in 1908, the Church meticulously restored the heritage site. The Church further completed 21st-century upgrades to the entire structure, as well as the addition of two full storeys. As an Ideal Org, the building now accommodates the Church’s ever-growing congregation and serves as a hub for people of all faiths and cultures across New South Wales. The Church of Scientology Sydney welcomes all visitors wishing to obtain an introduction to Dianetics and Scientology. The Public Information Centre presents more than 500 films, providing a complete introduction to every aspect of Dianetics and Scientology—including the beliefs and practises of the religion and an array of Church-sponsored humanitarian and social betterment programmes. The Chapel further serves as an ideal venue for civic occasions, including receptions and formal banquets, in the name of community partnerships across the city. The bookstore makes available Founder L. Ron Hubbard’s scripture on Dianetics and Scientology. In all, Mr. Hubbard’s legacy comprises tens of millions of published words in dozens of books and thousands of recorded lectures. These materials are available in 50 languages. The Sydney café welcomes those touring the Church or attending the many scheduled events. It is further provided for parishioners during breaks in their Scientology services. Seminar Rooms are provided for evening and weekend seminars on the fundamentals of Dianetics and Scientology, while Introductory Courses are offered in the Church’s multiple course rooms. The Public Theory course room is where any one of 20 Scientology Life Improvement Courses are taken. Each course addresses life’s most pressing concerns including relationships, parenting, personal motivation, honesty and integrity. L. Ron Hubbard developed the Purification Programme to free individuals from the mental and spiritual damage caused by drugs and toxins, through a regimen of exercise, sauna and nutrition—all of which is provided for in this Purification Centre. The Hubbard Guidance Centre is where Scientologists participate in auditing (spiritual counselling). Beyond this waiting area are rows of auditing rooms to meet the needs of a growing Sydney congregation. Scientology auditing (spiritual counselling) is delivered in an array of auditing rooms like this one, each of which provides a quiet, distraction-free environment necessary to achieve spiritual enlightenment. The Academy is where Scientologists train to become auditors (spiritual counsellors) capable of applying the technology of auditing to help others attain spiritual freedom. The Sydney Academy comprises multiple course rooms, each devoted to a different aspect of training. The Field Activities Lounge is where Scientologists coordinate the ever-expanding network of Scientology Groups and Missions. It is also here they collaborate with like-minded organisations for broadscale community outreach. The Office of L. Ron Hubbard stands in honour of the Founder and symbolises that this Church is true to his writings and ideals. The home of the Scientology Ideal Organisation of Sydney was originally constructed in 1908 and stands today as a landmark in the city centre. The Church preserved the Federation Free Classical style structure, thereby returning its historic features to their original glory. The many architectural details restored by the Church of Scientology include the historic terrazzo stairway and columns which extend three storeys of the New South Wales heritage site. 201 Castlereagh Street—the site of Sydney’s new Ideal Org. The Church carefully restored the building’s historic features, most notably the brick pilasters and bronze-glazed glass curtain that distinguish its façade. Now transformed to fully ideal standards, the site will provide Scientology services for Sydney’s ever growing congregation and stands to serve as a significant part of the Castlereagh Street landscape for the centuries to come. On the evening of May 3, more than 2,500 Scientologists from across Australia filled Castlereagh Street to inaugurate the Harbour City’s new Church of Scientology Ideal Organisation (Ideal Org). In honour of the historic occasion, the ecclesiastical leader of the Scientology religion and Chairman of the Board Religious Technology Center, Mr. David Miscavige, travelled to Sydney to lead the dedication ceremonies. The Church’s home, a heritage site originally constructed in 1908, overlooks Hyde Park and stands amid several of the city’s most treasured landmarks—including Town Hall, the Queen Victoria Building and Sydney Tower. The Church meticulously restored the building’s historic features, most notably the brick pilasters and bronze-glazed glass curtain that distinguish its Castlereagh façade. The Church further completed 21st-century upgrades to the entire structure, as well as the addition of two full storeys. As an Ideal Org, the building now accommodates the Church’s ever-growing congregation and serves as a hub for people of all faiths and cultures across New South Wales. National and state dignitaries welcoming the new Church included National Member of Parliament, the Honourable Julie Owens; President of the Australian Human Rights Council for Education and Medal of the Order of Australia recipient, Dr. Sev Ozdowski; Programmes Manager, Young Offenders Support Service, Ms. Kalisi Bese; and Aboriginal Elder of the Dunghutti People, Mr. Bill Allen. The Harbour City’s new Ideal Org provides all visitors with an introduction to Dianetics and Scientology, beginning with the Public Information Centre. Its displays, containing more than 500 films, present the beliefs and practices of the Scientology religion and the life and legacy of Founder L. Ron Hubbard. The Information Centre also offers a detailed overview of the many Church-sponsored humanitarian programmes—including a worldwide human rights education initiative; an equally far-reaching drug education, prevention and rehabilitation programme; a global network of literacy and learning centres; and the Scientology Volunteer Minister programme, now comprising the world’s largest independent relief force. The Centre is open morning to night for visitors to tour at their leisure and return as often as they wish. The Church’s Chapel provides for Scientology congregational gatherings, including Sunday Services, Weddings and Naming Ceremonies as well as a host of community-wide events open to members of all denominations. The new Ideal Org further includes multiple seminar rooms and classrooms, in addition to an entire floor dedicated to Scientology auditing (spiritual counselling). A monumental release of the Golden Age of Tech Phase II, guaranteeing standard LRH Technology across both the processing and training sides of the Scientology Bridge to Clear and dramatically speeding progress up that Bridge. Asia’s first Ideal Org in Kaohsiung, Taiwan—with all auditor training materials now available, for the first time, in Chinese. The opening of a first-ever Ideal Advanced Organisation in the heart of Copenhagen, Denmark—the Ideal Advanced Organisation and Saint Hill Europe. And the dedication of an Ideal Pacifica Bridge on L. Ron Hubbard Way in Los Angeles, California; comprising Organisations paralleling the Bridge to Total Freedom.